Fall is my favorite time of year for so many reasons; the warm days and cool nights, fire-colored foliage, seasonal foods, and traditions that get friends and families together. The Ashfield Fall Festival, held every Columbus Day weekend in Ashfield, Massachusetts, is the prime event of the season. I can find all my favorite things of fall during those few days. We had beautiful weather for the weekend. Cold enough to wear a cozy sweater, but after sitting in the sun for a few minutes on the grassy hill, it definitely didn’t feel like winter was coming any time soon. The leaves were at the peak of their season. The food of the festival always includes corn chowder, baked potatoes, apple cider, caramel apples, apple pie with cheddar, and apples from Ashfield orchards. Fried dough with maple cream, maple cotton candy, and every other maple product you can imagine are sold from Gray’s Sugarhouse and South Face Farm. There are burgers and kielbasa, baked goods and fresh pumpkin doughnuts from the Boy Scouts! You have to attend the festival both Saturday and Sunday in order to eat everything! Or you can take some ideas from Storey’s seasonal cookbooks and make your own fall food. are a few great options for finding fall recipes. It is always great to see locals from Ashfield, old classmates, good friends, and of course my family. We all scrounge for treasures at the tag sales, listen to the musicians, eat our fill of festival food, and shop for unique items from local craftsmen. Here is an amazing table from my neighbors, Ashfield Stone. This year I headed to my parents' house with some visiting family for a nice fall meal after the festival. A cozy, festive table setting is the perfect finish to an autumn day. This one is from Woodland Style by Marlene Hurley Marshall, photography by Sabine Vollmer von Falken. 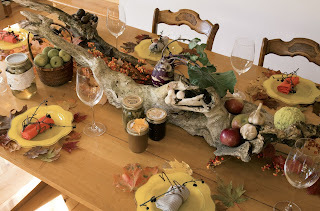 Make your own fall decorations with other inspirations from Woodland Style! What are a few of your favorite fall things?